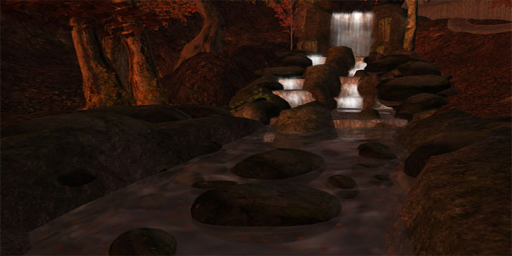 In 2005, when Second Life was still quite young, a couple of friends began learning the ropes within the game. The first object thrown out on the ground was a small tree with rustling orange and yellow leaves. Soon, after learning how to copy objects, their small piece of land was completely covered in trees and a forest was born. A campfire was built in a grove of trees and with this fire a spark was ignited. A creative spark that grew into a roaring flame with a great number of friends gathered around it, sharing experiences and stories and meeting for the first time or returning year after year. 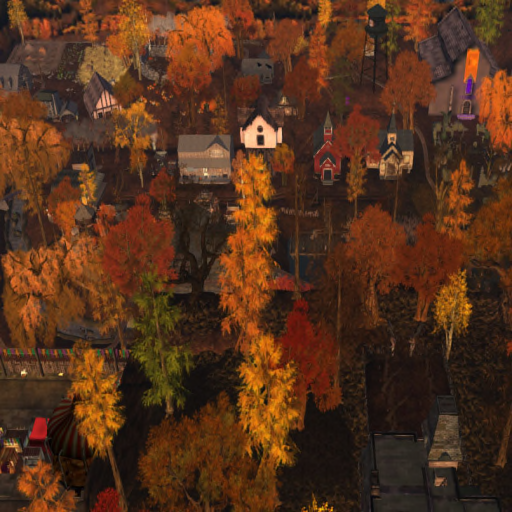 Octoberville ran in Second Life from 2005 to 2011 as a game within a game. 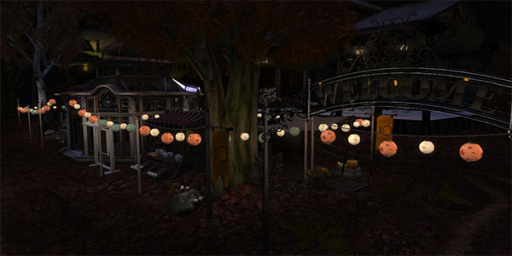 The folks at Pixeltrix wanted to bring something new to SL, an atmosphere, an experience that would be shared and loved by others. Then we decided to make it even more fun and help people to explore what we had built by hiding clues and items to find like in an Easter egg hunt. Our undying love for the beauty and wonder of Autumn fueled our creativity. There is something undeniably magical about the fall, especially in the country. Designed around the sweet memories of growing up in a tiny town in Kentucky, Octoberville drew it's inspiration from the people, places and pumpkin patches of Henry County. We never dreamed it would grow to such popularity over those seven years. Still to this day, in 2015, we receive letters, emails and messages remembering and honoring our beloved creation. Our fans have kept Octoberville alive and showed us their love through their many pictures and videos posted online. We honestly cherish every single one of them because it is a piece of our history and brings back fond memories. Google or search FLICKR for Octoberville to see over 1200 pictures for yourself and take a trip down memory lane or see it for the first time. We happily return this year, thanks to the Linden Endowment for the Arts and our fans. The doors will open at 2 PM SLT on the LEA 9 sim. The creepy, dark corners of an odd house that seemed never ending at times, dancing the night away at the always wacky and weird, Crowbar, riding the train through the deep, colorful forest at night, hanging out at the general store to meet new friends over a cup of hot apple cider, running through the cornfields and screaming as a ghost popped out from inside the old barn, finding all the clues and solving the mystery of the devilish Dr. Dalton. Halloween adventure awaits at Octoberville 2015! One of the Best and earliest hunts in SL !